Unfortunately, Hollywood, TV, and yes, a few authors have privates and sergeants knowing the overall situation of a battle. Audie Murphy who played himself in the movie To Hell and Back won the Congressional Metal of Honor and was the most decorated soldier in WWII. He didn't know what was happening a mile away in most cases and such is Warfare for Writers - Fog of War. Have this uncertainty effect your characters and the plot! Have it get on their nerves, and in some cases they may become irrational. It is definitely a good plot device. 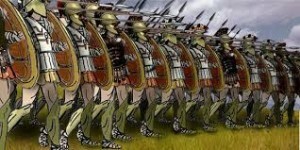 Historically, soldiers and troopers have been put on the battle field in one of two ways: Close Order or Open Order. 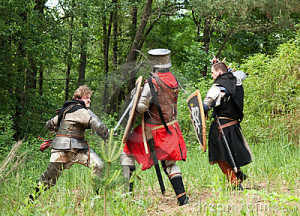 Close order is where warriors are more or less shoulder to shoulder and within an arm's reach of the warrior ahead or behind. Soldiers are psychologically supported by direct, even physical peer pressure. Your "buddy" is helping with his actions and words to lead you forward. It puts a lot of power in one place and ready to strike. The warriors in the trenches during WWI would be considered in close order as would warriors in columns or lines. Projectiles or artillery would kill more warriors when rained down on the warriors head or even nearby in a hard-to-miss target. A lot more people would die. A formation which is spread out in either groups of two or three men, if not, singly. There will be reduced casualties. Psychologically, the warrior is on his own to face the fears and indecisions of the situation. Communications with the leaders may break down and with other groups of men. If you have a warrior in battle, you should have some sense of what formation they are in, what they can and can't do, along with what they can see. Also, the unit's purpose must be clear. These factors will effect the warrior psychologically. Note: This information was taken from a lecture by Timions Esaias with his permission.